Photograph by Roger Stalley. 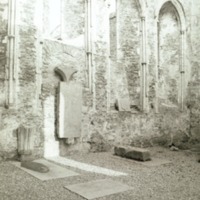 Paired clerestory windows with trefoil heads in north elevation of nave. 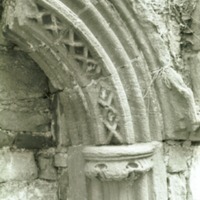 Rear arches moulded with dogtooth ornament. 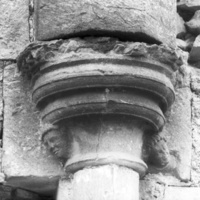 Bonded shafts on the outermost jambs and detached shaft in centre with stiff - leaf foliage capitals. 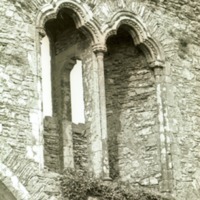 Wall passage between windows has arch with chamfered jambs and stepped head. 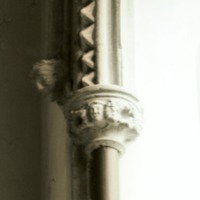 Photograph by Roger Stalley.Detail showing shaft and head captial with stiff - leaf foliage. Dogtooth ornament is framed by hood moulding with head stop. Photograph by Roger Stalley. 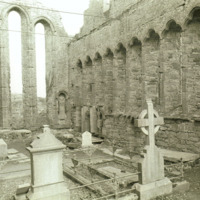 East elevation of north transept showing tomb slabs and four lancet windows. 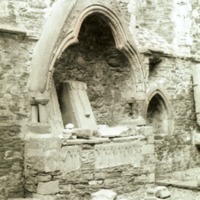 Arches have roll - and - fillet mouldings, dogtooth ornament, shafts with captials and annulet rings and water - holding bases. They are surmounted by hood mouldings terminating in hood stops featuring floral buds and head carvings.